"As a fictional hero, William Stoner will have to dwell in obscurity forever. But that, too, is our destiny. Our most profound acts of virtue and vice, of heroism and villainy, will be known by only those closest to us and forgotten soon enough. Even our deepest feelings will, for the most part, lay concealed within the vault of our hearts. Much of the reason we construct garish fantasies of fame is to distract ourselves from these painful truths. We confess so much to so many, as if by these disclosures we might escape the terror of confronting our hidden selves. 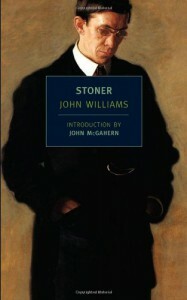 What makes “Stoner” such a radical work of art is that it portrays this confrontation not as a tragedy, but the essential source of our redemption." "A moving story, but also awfully depressing. I had a hard time continuing on at points, especially when the author made it so clear that better things could have happened. After following the main character through his life though, I was sad to see how it all came to an end." Perhaps I'll re-read it sometime, especially after reading this piece about it. I just don't know if I need something potentially depressing right now.